How Are You Celebrating I Love NYC Pets Month? With two more weeks to go, you can still be a part of our annual month-long celebration that shines a spotlight on NYC’s pets and celebrates that special bond you and your pet(s) share! Looking to expand your family? We can think of no better way to celebrate I Love NYC Pets Month than by adopting a homeless cat, dog, or other pet from a shelter or rescue group. Visit www.AnimalAllianceNYC.org/adopt for a calendar of adoption events in February, a listing of regular adoption hours and locations for many of our participating shelters and rescue groups, and other pet adoption resources and tips. Enjoy all the fun at this very special fundraiser for the Mayor’s Alliance for NYC’s Animals at the legendary Copacabana! Your hosts for the evening will be Kathleen Deady and Wheels of Hope driver Debra Fierro. Event highlights include a five-hour open bar; cocktail hour with hors d’oeuvres; ice sculpture vodka bar; four-course formal dinner; dancing to the tunes of DJ Susan Levine; and 50/50 and silent auction fundraisers. 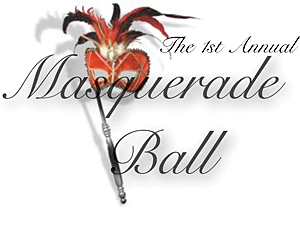 Tickets are $130 per person and may be purchased online through Friday, February 24, at www.FebruaryMasquerade.com, or at the door (cash only, please). 100% of raffle and silent auction proceeds, plus 10% of net ticket sales, will be donated to fund the life-saving programs of the Mayor’s Alliance. The silent auction will feature three pet gift baskets (total value $500) donated by A Place for Paws, 1675B East Jericho Turnpike, Huntington, NY. Please support them for their generosity! Note: This is a humans-only event. 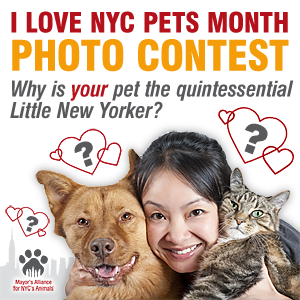 If your animal companion the quintessential, loveable Little New Yorker, then share a photo of your pet with us this month for a chance to win a fun prize! This photo contest runs through February 28, 2012. Throughout February, you, your friends, and all Mayor’s Alliance Facebook fans can vote for their favorite photos each day. After the contest closes at 11:59 p.m. on February 28, we’ll determine the three photos that received the most votes, and will announce the winners on our website and blog. All three winners will be featured in a special article that will appear on the Mayor’s Alliance website and blog in March, and the winning photos will appear on our website’s home page. 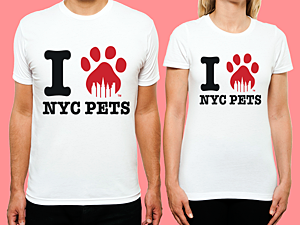 Each winner will also receive two limited edition Mayor’s Alliance I Love NYC Pets t-shirts from SocialPakt — you pick the sizes. Wear your love for your pet year-round! The original design by NYC-based artist Charlie Tsampa for SocialPakt evokes one of the globally recognized emblems of New York City, and can be proudly worn by anyone who loves animals. These tees are available for $20 each, in adult sizes only, through February 29 on the SocialPakt website. The Mayor’s Alliance receives $6 from every sale.